LIONEL MESSI - The best of the best! LIONEL MESSI is the best footballer in history. It not stop to suprise you in each match. 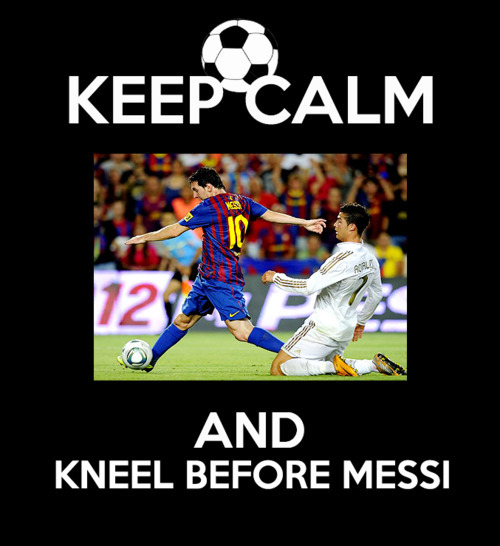 Even another great footballer kneel befor him. Lionel Andrés "Leo" Messi (born 24 June 1987 in Rosario, Argentina) is an Argentine footballer who currently plays for FC Barcelona and captains the Argentina national team as a striker or winger. He is regarded as one of the best football players of his generation, Messi received several Ballon d'Or and FIFA World Player of the Year nominations by the age of 21, and won in 2009 and 2010. His playing style and ability have drawn comparisons to Diego Maradona, who himself declared Messi as his "successor". Messi began playing football at a young age and his skill and potential was soon realized by Barcelona. He left Rosario-based Newell's Old Boys's youth team in 2000 and moved with his family to Europe, as Barcelona offered treatment for his growth hormone deficiency. Making his debut in the 2004–05 season, he broke his team record for the youngest footballer to score a league goal. Major honours soon followed as Barcelona won La Liga in Messi's debut season, and won a double of the league and Champions League in 2006. His breakthrough season was in the 2006–07 season; he became a first team regular, scoring a hat-trick in El Clásico and finishing with 14 goals in 26 league games. Messi then had the most successful season of his playing career, the 2008–09 season, in which he scored 38 goals to play an integral part in a treble-winning campaign. This record-breaking season was then eclipsed in the following 2009–10 campaign, where Messi scored 47 goals in all competitions, equalling Ronaldo's record total for Barcelona. He surpassed this record again in the 2010–11 season with 53 goals in all competitions. Messi has won five La Liga titles, three Champions League titles, scoring in two of those finals, against Manchester United in both 2009 and 2011. He was not on the pitch as Barcelona defeated Arsenal in 2006, but received a winners' medal from the tournament. After scoring 12 goals in the 2010–11 Champions League, Messi became only the third player (after Gerd Müller and Jean-Pierre Papin) to top-score in three successive European Champion Clubs' Cup campaigns. However, Messi is the first one to win the Champions League top scorer titles for three consecutive years after Champions League changed its format in 1992. Messi was the top scorer of the 2005 FIFA World Youth Championship with six goals, including two in the final game. Shortly thereafter, he became an established member of Argentina's senior international team. In 2006, he became the youngest Argentine to play in the FIFA World Cup and he won a runners-up medal at the Copa América tournament the following year. In 2008, in Beijing, he won his first international honour, an Olympic gold medal, with the Argentina Olympic football team. At international level Messi has scored 17 goals in 62 games. Messi played in Barcelona's junior Infantil and Cadete teams from 2000 to 2003 (scoring 37 goals in 30 matches in Cadete A). Season 2003–04 saw him in five different teams: He started one match in Juvenil B (1 goal) and got promoted to Juvenil A (14 matches, 21 goals). Later he debuted for FC Barcelona C team (Tercera División) on 29 November 2003 and for FC Barcelona B (Segunda División B) on 6 March 2004. He played for both teams during the season (8 matches, 5 goals and 5 games, 0 goals, respectively). Even before these two debuts, Messi made his official debut for the first-team on 16 November 2003 aged 16 years and 145 days, in a friendly match against Porto. Less than a year later, Frank Rijkaard let him make his league debut against RCD Espanyol on 16 October 2004 (at 17 years and 114 days), becoming the third-youngest player ever to play for Barcelona and youngest club player who played in La Liga. 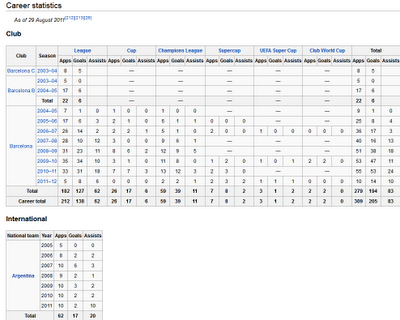 This record was broken by Bojan Krkić in September 2007. When he scored his first senior goal for the club against Albacete Balompié on 1 May 2005, Messi was 17 years, ten months and seven days old, becoming the youngest to ever score in a La Liga game for Barcelona until it was again broken by Bojan Krkić in 2007, scoring from a Messi assist. Messi said about his ex-coach Rijkaard: "I'll never forget the fact that he launched my career, that he had confidence in me while I was only sixteen or seventeen." Messi played also in Barcelona B during the season. Messi is Barcelona's third highest goalscorer behind second László Kubala and first César Rodríguez Álvarez in all official competitions. Messi netted six goals in 17 league appearances, and scored one Champions League goal in six. His season ended prematurely on 7 March 2006, however, when he suffered a muscle tear in his right thigh during the second leg of the second round Champions League tie against Chelsea. Rijkaard's Barcelona ended the season as champions of Spain and Europe. 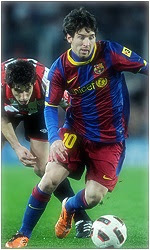 In the 2006–07 season, Messi established himself as a regular first team player, scoring 14 times in 26 matches. On 12 November, in the game against Real Zaragoza, Messi suffered a broken metatarsal, ruling him out for three months. Messi recuperated from his injury in Argentina, and his return to action came against Racing Santander on 11 February, where he came on as a second-half substitute. On 11 March, El Clásico saw Messi in top form, scoring a hat-trick to earn 10-man Barcelona a 3–3 draw, equalising three times, with the final equaliser coming in injury time. In doing so he became the first player since Iván Zamorano (for Real Madrid in the 1994–95 season) to score a hat-trick in El Clásico. Messi is also the youngest player ever to have scored in this fixture. Towards the end of the season he began finding the net more often; 11 of his 14 league goals for the season came from the last 13 games. Upon Ronaldinho's departure from the club, Messi inherited his number 10 jersey. On 1 October 2008, during a Champions League match against Shakhtar Donetsk, Messi scored two goals during the last seven minutes, after coming on as a substitute for Thierry Henry, to turn a 1–0 deficit to a 2–1 victory for Barcelona. The next league game was versus Atlético Madrid, a match billed as a friendly battle between Messi and his good friend Sergio Agüero. Messi scored a goal from a free kick and assisted another as Barça went on to win the match 6–1. Messi netted another impressive brace against Sevilla scoring a volley from 23 metres (25 yd) and then dribbling round the goalkeeper and scoring from a tight angle for the other. On 13 December 2008, during the first Clásico of the season, Messi scored the second goal in Barcelona's 2–0 win over Real Madrid. 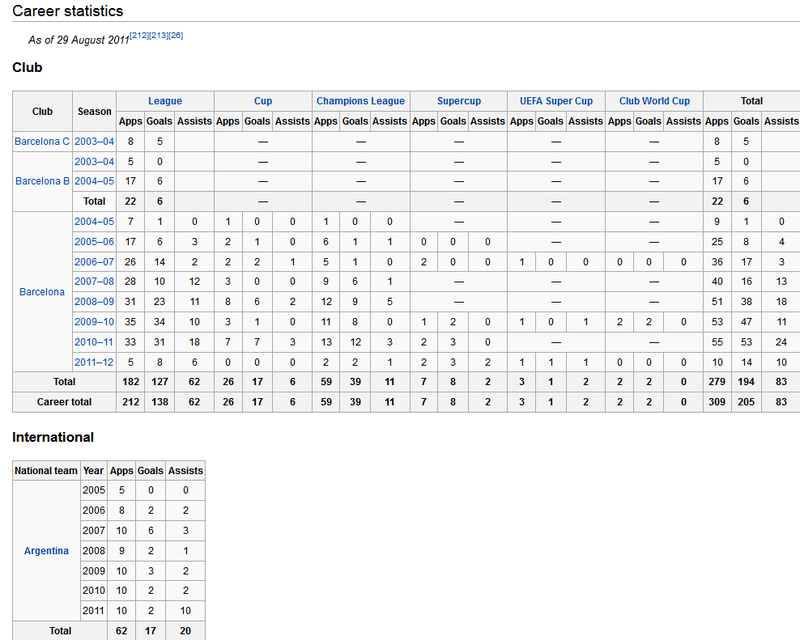 He was also named second in the 2008 FIFA World Player of the Year awards with 678 points. Messi scored his first hat-trick of 2009 in a Copa del Rey tie against Atlético Madrid which Barcelona won 3–1. Messi scored another important double on 1 February 2009, coming on as a second half substitute to help Barcelona defeat Racing Santander 1–2 after being 1–0 down. The second of the two strikes was Barcelona's 5000th league goal. In the 28th round of La Liga, Messi scored his 30th goal of the season in all competitions, helping his team to a 6–0 victory over Málaga CF in the process. On 8 April 2009, he scored twice against Bayern Munich in the Champions League, setting a personal record of eight goals in the competition. On 18 April, Messi notched his 20th league goal of the season in a 1–0 win at Getafe, allowing Barcelona to maintain their six-point advantage at the top of the league table over Real Madrid. As Barcelona's season was drawing to a close, Messi scored twice (his 35th and 36th goals in all competitions) to cap a 6–2 win over Real Madrid at the Santiago Bernabéu in what was Real's heaviest defeat since 1930. After scoring each goal, he ran towards the fans and the cameras lifting up his Barcelona jersey and showing another T-shirt that read Síndrome X Fràgil, Catalan for Fragile X Syndrome, to show his support for children who suffer from the affliction. Messi was involved in the build-up to Andrés Iniesta's injury time goal against Chelsea in the Champions League semi-final to send Barcelona through to face Manchester United in the final. He won his first Copa del Rey on 13 May, scoring one goal and assisting another two, in a 4–1 victory over Athletic Bilbao. He helped his team win the double by winning La Liga. On 27 May he helped Barcelona win the Champions League by scoring a second goal in the 70th minute giving Barcelona a two goal lead; he also became the top scorer in the Champions League, the youngest in the tournament's history, with nine goals. Messi also won the UEFA Club Forward of the Year: and the UEFA Club Footballer of the Year rounding off a spectacular year in Europe. This victory meant Barcelona had won the Copa del Rey, La Liga and Champions League in the one season, and was the first time a Spanish club had ever won the treble. After winning the 2009 UEFA Super Cup, Barcelona manager Josep Guardiola asserted that Messi was probably the best player he had ever seen. On 18 September, Messi signed a new contract with Barcelona, running until 2016 and with a buy-out clause of €250 million included, making Messi, along with Zlatan Ibrahimović, the highest paid players in La Liga, with earnings of around €9.5 million yearly. Four days later, on 22 September, Messi scored two goals and assisted another in Barça's 4–1 win over Racing Santander in La Liga. He scored his first European goal of the season on 29 September in a 2–0 win over Dynamo Kyiv, and then took his goal tally to six goals in seven games in La Liga with a strike during a 6–1 routing of Real Zaragoza at Camp Nou. On 19 December, Messi scored the winner in the final of the 2009 Club World Cup against Estudiantes in Abu Dhabi, giving the club their sixth title of the year. Two days later, he was given the FIFA World Player of the Year award, beating Cristiano Ronaldo, Xavi, Kaká and Andrés Iniesta to the award. This was the first time he had won the award, and he became the first Argentinean to ever receive this honour. On 10 January 2010, Messi scored his first hat-trick in 2010 and his first hat-trick of the season against CD Tenerife in the 0–5 victory, and on 17 January he scored his 100th goal for the club in the 4–0 victory over Sevilla. Messi then started an impressive run scoring 11 goals in five games. First he scored on the 84th minute against Málaga for a 2–1 win, then he scored two goals against UD Almería in a 2–2 tie. He continued his spree with an impressive week where he scored eight goals; he started by scoring a hat-trick against Valencia CF in a 3–0 home win, then he scored two goals against Stuttgart, in a 4–0 win that secured Barcelona's qualification to the quarterfinals of the Champions League, and finally he scored another hat-trick against Zaragoza in a 4–2 away win, becoming the first Barcelona player to score back-to-back hat-tricks in La Liga. He played his 200th official match for Barcelona against Osasuna on 24 March 2010. On 6 April 2010, for the first time in Messi's career he scored four goals in a single match, netting the lot in a 4–1 home win over Arsenal in the Champions League quarter-final second leg. This also saw him overtake Rivaldo as Barcelona's all time greatest scorer in the competition. On 10 April, Messi scored his 40th goal of the season when he netted the first goal in a 2–0 away win against title-rivals Real Madrid in El Clásico. On 1 May, Messi played his 50th game of the season and scored two goals on a 4–1 away win against Villarreal. Just three days later, on 4 May, Messi scored two goals in another 4–1 win at home against Tenerife. Messi scored his 32nd goal of the La Liga season on 8 May, during an away win against Sevilla, and in the final match against Valladolid, he scored two goals in the second half to tie Ronaldo's club record of 34 goals in a single league season, set in 1996–97, and to finish four goals behind the all-time record held by Telmo Zarra. He was named La Liga player of the year for the second year in a row on 3 June 2010. On 21 August 2010, Messi scored a hat-trick in his first start of the season in a 4–0 victory over Sevilla FC in the Supercopa de España, helping Barcelona secure their first trophy of the season after a 1–3 first leg loss. He also began his league season with a goal, scoring after just three minutes against Racing Santander on 29 August 2010. He then continued his excellent form into the UEFA Champions League group stage match against Panathinaikos where he scored two goals, assisted another two and also hit the frame of the goal on two separate occasions. On 19 September 2010, Messi suffered an ankle injury due to an ill-advised tackle by Atlético Madrid defender Tomáš Ujfaluši in the 92nd minute of their Round 3 match at the Vicente Calderón Stadium. At first sight it was feared that Messi suffered a broken ankle that could have kept the star player away from the pitch for a minimum of six months, but MRI performed the next day in Barcelona showed he suffered a sprain in the internal and external ligaments of his right ankle. Team-mate David Villa stated "the tackle on Messi was brutal" after watching the video of the play and also added that he believed the Atlético defender "didn't go into the tackle to hurt". The incident caused widespread media attention and brought up the debate of equality in protecting all players in the game. When Messi recovered he scored in a 1–1 tie against RCD Mallorca. He then scored another brace on the UEFA Champions League against København and helped the team to a 2–0 home win. He continued his impressive scoring run with braces against Zaragoza and Sevilla. After a prolific October, he started November scoring on an away 1–1 tie against København and an away 3–1 win against Getafe where he also assisted team-mates David Villa and Pedro Rodríguez. In the next fixture against Villarreal CF, he scored combining with Pedro, which gave Barcelona a 2–1 lead. He scored another goal and Barcelona won 3–1. This was the 7th consecutive match in which Messi scored, breaking his own previous record of 6. He also achieved the feat of scoring 50 goals in the calender year of 2010 with the 1st goal, while with the second goal, he achieved the same feat again, this time considering the goals he scored wearing a Barcelona shirt in 2010. Against Almería he scored his second hat-trick of the season in an impressive 8–0 away win, the second goal was his 100th La Liga goal. He scored on his ninth game in a row (10th including a friendly against Brazil) on a 3–0 away win against Panathinaikos. Messi's goalscoring run ended on 29 November at El Clásico but Barcelona still managed to win 5–0 with Messi assisting Villa twice. The next match day he scored a brace and gave an assist against Osasuna. He followed with another brace against Real Sociedad. In El Derbi, a match Barcelona won 1–5, he assisted teammates Pedro and Villa to score one goal each. His first goal in 2011 came against Deportivo La Coruña with a free kick on a 4–0 away win, where he once again assisted both Pedro and Villa. Messi won the 2010 FIFA Ballon d'Or, beating his Barcelona teammates Xavi and Iniesta. Messi had been nominated for the awards for the fourth consecutive year. Only two days after he won the award he scored his first hat-trick of the year and third of the season against Real Betis. He began the second round of the league with a goal, scoring his second penalty against Racing Santander. After scoring the penalty kick, Messi revealed a message on his undershirt that said, "Happy birthday, mami.". He continued his goalscoring form with a brace against Almería in the Copa del Rey semifinal, and followed it up with another brace less than a week later against Hércules CF. On 5 February, Barcelona broke the record for most consecutive league wins with 16 victories after they defeated Atlético Madrid 3–0 at the Camp Nou. Lionel Messi scored a hat-trick to ensure the victory for his side and after the match he stated, "it's an honor to be able to pass a record set by a great like Di Stéfano" and "if the record has been around for so long is because it's very complicated to achieve and we have reached it by defeating a very difficult team who's going through a bad situation, which makes it even more difficult." After two scoreless games he scored the winner against Athletic Bilbao in which Barcelona won 2–1. The next week he scored the first header of the season against Mallorca on a 3–0 away win. This victory was the equalising a La Liga record set by Basque club Real Sociedad in the 1979–80 campaign with a 19 unbeaten away matches. The record was broken after three days later when Messi scored the only goal on an away victory over Valencia. On 8 March, Messi scored two goals against Arsenal in a UEFA Champions League match at the Camp Nou, helping Barcelona win 3–1 and qualify to the quarter-finals of the competition. After failing to score for a month he scored a brace against Almería; the second goal was his 47th of the season, equalling his club record return of the previous season. He surpassed his record on 12 April 2011 by scoring the winner against Shakhtar Donetsk in a UEFA Champions League game, which put him in the record book as all time top scorer in a single season for Barcelona. He scored his eight goal on El Clásico on a 1–1 tie at the Santiago Bernabéu Stadium. On 23 April, Messi scored his 50th goal of the season against Osasuna in a 2–0 home victory which he came on as a substitute in the 60th minute. In the first leg of the Champions League semi-finals he gave a memorable performance, scoring twice against Real Madrid in a 2–0 win, the second goal (a dribble past several players) being acclaimed as one of the best ever at that stage of the competition. At the Champions League Final at Wembley, Messi scored the eventual game-clinching goal to give Barcelona their third title in six years and fourth overall. Messi started the season by lifting the Spanish Supercup with Barcelona, scoring three goals and providing two assists in a 5–4 aggregate win against Real Madrid. His vital interventions continued in the next official match played against Porto when he scored again following a weak back pass from Fredy Guarín before setting up Cesc Fàbregas to give Barcelona a 2-0 victory and the UEFA Super Cup, the only official competition that remained for him to score in. Messi's La Liga campaign began with two goals against Villarreal and he would go on to score hat-tricks in back to back home games against Osasuna and Atletico Madrid. On September 28 Messi scored his first two Champions League goals of the season against BATE Borisov becoming Barcelona's second highest goalscorer in its history, tying László Kubala, at 196 goals in all official competitions. In June 2004, he debuted for Argentina, playing in an under-20 friendly match against Paraguay. In 2005 he was part of a team that won the 2005 FIFA World Youth Championship in the Netherlands. There, he won the Golden Ball and the Golden Shoe, scoring in the last four of Argentina's matches and netting a total of six for the tournament. He made his full international debut on 17 August 2005 against Hungary at the age of 18. He was substituted on during the 63rd minute, but was sent off on the 65th minute because the referee, Markus Merk, found he had headbutted defender Vilmos Vanczák, who was tugging Messi's shirt. The decision was contentious and Maradona even claimed the decision was pre-meditated. Messi returned to the team on 3 September in Argentina's 1–0 World Cup qualifier away defeat to Paraguay. Ahead of the match he had said "This is a re-debut. The first one was a bit short." He then started his first game for Argentina against Peru; after the match Pekerman described Messi as "a jewel". On 28 March 2009, in a World Cup Qualifier against Venezuela, Messi wore the number 10 jersey for the first time with Argentina. This match was the first official match for Diego Maradona as the Argentina manager. Argentina won the match 4–0 with Messi opening the scoring. On 17 November 2010, Messi scored a last-minute goal against South American rivals Brazil after an individual effort to help his team to a 1–0 win in the friendly match, which was held in Doha. This was the first time that he had scored against Brazil at senior level. Messi scored another last-minute goal on 9 February 2011 against Portugal in a penalty kick which he give his side a 2–1 victory in the friendly match, which was held in Geneva, Switzerland. The injury that kept Messi from playing for two months at the end of the 2005–06 season jeopardised his presence in the 2006 World Cup. Nevertheless, Messi was selected in the Argentina squad for the tournament on 15 May 2006. He also played in the final match before the World Cup against the Argentine U-20 team for 15 minutes and a friendly match against Angola from the 64th minute. He witnessed Argentina's opening match victory against Ivory Coast from the substitute's bench. In the next match against Serbia and Montenegro, Messi became the youngest player to represent Argentina at a World Cup when he came on as a substitute for Maxi Rodríguez in the 74th minute. He assisted Hernán Crespo's goal within minutes of entering the game and also scored the final goal in the 6–0 victory, making him the youngest scorer in the tournament and the sixth youngest goalscorer in the history of the World Cup. Messi started in Argentina's following 0–0 draw against the Netherlands. In the following game against Mexico, Messi came on as a substitute in the 84th minute, with the score tied at 1–1. He appeared to score a goal, but it was ruled offside with Argentina needing a late goal in extra time to proceed. Coach José Pekerman left Messi on the bench during the quarter-final match against Germany, which they lost 4–2 on a penalty shootout. Messi played his first game in the 2007 Copa América on 29 June 2007, when Argentina defeated United States 4–1 in the first game. In this game, he showed his capabilities as a playmaker. He set up a goal for fellow striker Hernán Crespo and had numerous shots on target. Tevez came on as a substitute for Messi in the 79th minute and scored minutes later. His second game was against Colombia, in which he won a penalty that Crespo converted to tie the game at 1–1. He also played a part in Argentina's second goal as he was fouled outside the box, which allowed Juan Roman Riquelme to score from a freekick, and increase Argentina's lead to 3–1. The final score of the game was 4–2 in Argentina's favor and guaranteed them a spot in the tournament's quarterfinals. In the third game, against Paraguay the coach rested Messi having already qualified for the quarter-finals. He came off the bench in place of Esteban Cambiasso in the 64th minute, with the score at 0–0. In the 79th minute, he assisted a goal for Javier Mascherano. In the quarter-finals, as Argentina faced Peru, Messi scored the second goal of the game, from a Riquelme pass in a 4–0 win. During the semi-final match against Mexico, Messi scored a lob over Oswaldo Sánchez to see Argentina through to the final with a 3–0 win. Argentina went on to lose 3–0 to Brazil in the final. Having barred Messi from playing for Argentina in the 2008 Olympics, Barcelona agreed to release him after he held talks with newly appointed coach Josep Guardiola. He joined the Argentina squad and scored the first goal in a 2–1 victory over Ivory Coast. He then scored the opening goal and assisted Ángel di María in the second to help his side to a 2–1 extra-time win against the Netherlands. He also featured in Argentina's match against rivals Brazil, in which Argentina took a 3–0 victory, thus advancing to the final. In the gold medal match, Messi again assisted Di María for the only goal in a 1–0 victory over Nigeria. Messi played the entire game on Argentina's opening match in the 2010 World Cup, the 1–0 victory against Nigeria. He had several opportunities to score but was repeatedly denied by Vincent Enyeama. Messi started in Argentina's following 4–1 win against Korea Republic; he participated in all of the goals of his team and helped Gonzalo Higuaín score a hat-trick. On the third and last group stage match Messi captained during Argentina's 2–0 win over Greece, again being the centrepoint of Argentina's play and was voted man of the match. At the Round of 16 he assisted Carlos Tévez for the first goal in a 3–1 win against Mexico. The referee awarded that goal even though it was a clear offside. The World Cup ended for Argentina with a 4–0 loss against Germany in the quarter-finals. Messi was nominated in ten player shortlist for Golden Ball award by FIFA Technical Study Group. The group identified Messi with words: "Outstanding in his pace and creativity for his team, dribbling, shooting, passing – spectacular and efficient". Messi took part in the Copa América in Argentina, where he failed to score a goal but notched three assists. He was selected man-of-the-match in matches against Bolivia (1–1) and Costa Rica (3–0). Argentina were eliminated in the quarter-finals in a penalty shoot-out against Uruguay (1–1 a.e.t. ), with Messi scoring as the first penalty taker. Messi was at one stage romantically linked to Macarena Lemos, also from his hometown of Rosario. He is said to have been introduced to her by the girl's father when he returned to Rosario to recover from his injury a few days before the start of the 2006 World Cup. He has in the past also been linked to the Argentine glamour model Luciana Salazar. In January 2009 he told "Hat Trick Barça", a programme on Canal 33: "I have a girlfriend and she is living in Argentina. I am relaxed and happy". He was seen with the girl, Antonella Roccuzzo, at a carnival in Sitges after the Barcelona-Espanyol derby. Roccuzzo is a fellow native of Rosario. Messi has two cousins also involved in football: Maxi, a winger for Club Olimpia of Paraguay, and Emanuel Biancucchi, who plays as a midfielder for Spain's Girona FC. In 2007 Messi established the Leo Messi Foundation, a charity supporting access to education and health care for vulnerable children. In an fansite interview, Messi said: “Being a bit famous now gives me the opportunity to help people who really need it, especially children." In response to Messi’s own childhood medical difficulties, the Leo Messi Foundation supports Argentine children diagnosed with medical conditions by offering treatment in Spain and covering the transport, hospital and recuperation costs. Messi’s foundation is supported by his own fundraising activity with additional assistance from Herbalife. On 11 March 2010 Messi was announced as a goodwill ambassador for UNICEF. Messi’s UNICEF ambassador activities are aimed at supporting children’s rights. Messi is supported in this by FC Barcelona, who also have a strong association with UNICEF. He is featured on the front covers of the video games Pro Evolution Soccer 2009 and Pro Evolution Soccer 2011 and is also involved in promotional campaigns for the games. Messi, along with Fernando Torres, is the face of Pro Evolution Soccer 2010, and was also involved in the motion capturing and the trailer. Messi is sponsored by the German sportswear company Adidas and features in their television advertisements. In June 2010, Messi also signed a three–year contract with Herbalife which further supports the Leo Messi Foundation. On April 2011, Messi was named in the 2011 TIME 100, the magazine's annual list of the most influential people in the world. Also in April 2011, Messi launched a Facebook page and within just a few hours his page had attracted more than six million followers. His Facebook page now has over 24 million followers.